DO YOU KNOW THERE IS SO MUCH MORE FOR YOU OUT THERE? I AGREE. I SEE IT TOO. WHAT'S INSIDE OF YOU IS SPECIAL. YOU CAN'T IGNORE IT. "I began to notice positive changes in myself after working with Steph for only a couple of weeks. She helped (and is helping) me in the process of shifting my paradigm around weight loss, exercise, health, fitness, and self-esteem. She has a gift for getting to the heart of an issue and using the just-right words to truly make an impact. I just know in my gut the effects of her mentorship will be lasting. I’ve tried other programs for everything from weight loss and nutrition to self-help, self-esteem, and self-discovery, and I’ve never had the growth, transformation, and insights like those I’ve already gleaned from my short time with Steph. I’ve been in therapy for over a year, and it doesn’t compare to the immediate, practical, lasting, and powerful epiphanies and shifts that have occurred since working with her. It might sound too good to be true. It might sound like some other promotion, or book, or program, but it’s not, because Steph doesn’t just address the symptoms--she addresses the root of the issue. So I know I will never go back to my junk food addiction and sad, sedentary lifestyle. I know that I am making changes that will provide me with a wonderful, abundant, confident, healthy, happy life. And she makes it fun, stress-free, and loving. And she’s genuine and compassionate. I couldn’t dream up a better coach. I know she genuinely wants me to grow and that with every week, she’s helping me to get stronger and more confident, so that I can own my own power and greatness, and one day--very soon--do it for myself. 1) I just didn’t have the money and 2) I wasn’t sure if it was just another gimmick. Since I didn’t know Steph prior to this, I wasn’t sure if I could believe it. Thank God, I took the leap. I laugh now, just thinking that I let money get in the way, since her coaching is worth ten times the cost. And what could possibly be more important than happiness, health, and self-love? She gives such consistent and frequent support, making herself available whenever you need her, going over the allotted 60-minute phone call often. Not to mention, she is always enthusiastic, positive, and 110% present in every session. IMAGINE driving down the road in your dream car. You're on the way to the house you've always wanted, it's yours now. You're going home to your best friend, the person who makes your heart skip a beat, the love of your life, they'll hug you when you get home and tell you how much you mean to them. You're driving home from work; a job fulfills you, makes you excited to wake up in the morning, it's a place where you make a difference in the world and get paid well to do it. You feel healthier and happier than ever before. You're fit and radiant from the inside out because you prioritize yourself and truly love your body. You inspire women everywhere you go by following your dreams. You realize that your life isn't a result of luck or good fortune. You created this life, you made a decision, you invested in yourself and you upgraded to a better, happier version of yourself by trusting in a mentor who knew how to get you there. You changed the way you do things in this world. ​You realize that you're living your dream life. THE 4 STEP TRAINING PROGRAM FOR HAVING IT ALL. BE THE WOMAN YOU'VE ALWAYS WANTED TO BE. YOU'RE ONLY ONE LIMITING BELIEF AWAY FROM WHAT YOU WANT MOST. There's one thing that all of these women have in common. They think differently than the average woman. They have the mindset of success. Upgrade your life and you'll learn this success mindset secret to confidence, fun, health, radiance and love. There's no cap on what's possible for you when you live your life with this mindset. ​Five years ago I was 30 pounds overweight, wishing for more love in my life, dreaming of a fulfilling career, hoping I could earn more than $25,000 a year and seeking adventure, happiness. I was depressed and couldn't get myself out of my bed some days. I now live a life greater than I ever dreamed possible. I experience meaningful love from a relationship that's beyond my wildest dreams. I live my purpose and get paid well to do it. I travel, experiencing the world with the love of my life. I have the time to get a great night's sleep, a fun workout, healthy home cooked meals and plenty of sunshine every day. I love my body and I continue to reach new heights of success daily. DO YOU DREAM OF A BETTER LIFE? ONE WITHOUT STRESS OVER YOUR BODY, MONEY, LOVE LIFE, JOB, YOUR PURPOSE. I BELIEVE EVERYTHING HAPPENS FOR A REASON AND I BELIEVE YOU'RE READING THIS RIGHT NOW BECAUSE LIFE IS GIVING YOU THE ANSWER TO SOMETHING YOU'VE BEEN ASKING FOR, FOR A LONG TIME. LET THIS OPPORTUNITY PASS YOU BY AND YOU COULD SPEND THE REST OF YOUR LIFE SEARCHING FOR WHAT'S RIGHT IN FRONT OF YOU RIGHT NOW. SOME PEOPLE LIVE THEIR ENTIRE LIFE AS A MUTED VERSION OF WHO THEY CAME HERE TO BE. DAILY CHECK-IN EVERY EVENING - I'll Personally Reach Out to You Daily To Check Your Progress, Guide You Through Blocks and Empower You to Live at Your Highest. Four months of deep, powerful transformation. 56 Daily Nutrition Schedules You'll know exactly what to eat for each meal, how much, and how to meal prep to save time. Think simple, quick, delicious and money saving. 8 Grocery Lists You'll know exactly what to eat and what to buy each week. Over 200 Delicious Recipes Healthy, nourishing and HIGHLY requested by husbands, kids and everyone in between. 56 Ab Toning, Fast, Fun, Fat Burning Workouts Quick and easy workouts you can do at home. 16 Nutrition Education Videos An important factor in weight loss success is a solid foundation of deep nutritional knowledge. 8 Time Saving Meal Prep Guides Following the meal prep guide allows you to save massive amounts of time during the week. It makes it easy to make healthy choices, even on stressful and busy days. You'll develop a new shape in you abs, legs, arms and booty. You'll clear and alleviate health problems keeping you from being your healthiest and most glowing self. You'll develop a radiant glow. Your hair, skin and nails will grow faster and healthier. You'll sleep better, alleviate sickness and have a noticeable increase in energy. You'll have access to my VIP group of health experts. You'll learn how to attract the relationship and person you want to spend your life with. You'll get training on how to create and keep love. How to re-discover love if life leads you down a path where you lose yourself. You'll learn how to strengthen and heal relationships with your family and friends and draw in your ultimate support group of lifelong community. You'll learn how to increase your income doing what you love with the 5 Week Money Mastery Series. You'll advance in your current career, excel in your own business and create additional income streams for easy passive income to use on vacations and other fun extras. You'll learn the 4 step process to make more money and enjoy work more. You'll create a lifestyle that makes you happy with the 5 Week Lifestyle Creation Program & Happiness Course. You'll learn how to be a leader in your world, how to inspire the women around you, how to live with passion, how to be the type of person that every woman wants to be. You'll learn your purpose and break through any limits you once had. You'll live a great life. 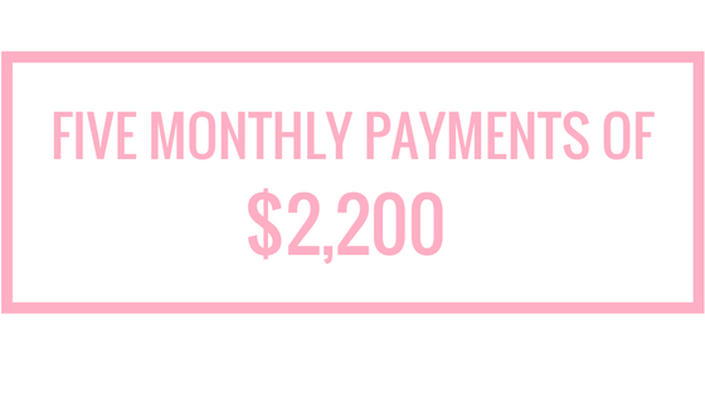 I ONLY OFFER 4 ENROLLMENTS PER MONTH, SO IF YOU'RE READY, SECURE YOUR SPOT. I strip away everything that's in the way of you being the upgraded woman inside of you. I can see what's holding you back and have the gift of showing you how to eliminate and replace it with the life you want. It's so powerful, it seems like magic. The information you'll learn in this program will never stop improving your life. You'll get a clear and easy to follow four month system for stripping down everything that's in the way. "ANYTHING IS POSSIBLE. KNOW YOUR PURPOSE. FOLLOW YOUR DESTINY. IT'S TIME TO UPGRADE." "I'D RATHER SPEND MY MONEY LEARNING THE RIGHT WAY TO LIVE THE LIFE I WANT THAN SPEND IT ON THINGS THAT HOLD ME BACK, BUILDING THICKER WALLS FROM THE FREEDOM I WANT." You spend a lot of money on things that aren't good for you. I used to do it too. One day I added up how much money spent on things that didn't make me a better person in a month. It was in the high hundreds. Over the course of a year it was in the thousands and you can imagine what that looks like over many years. I hated my life and at that moment I committed to putting my money toward things that would make my life what I wanted it to be. I started investing in myself. I did this because every time I purchased something that wasn't good for me I was building a thicker wall, a bigger barrier. This wall stood between me and my dream life. I was done talking about a better life and ready to finally start living it. If you want it bad enough, you'll find a way. Whether it's switching where you spend your money, borrowing money or taking a second job to afford programs and conferences that will progress you. If you want a better life, you'll find a way to fund it, if you want to keep talking about a better life you hope to have the rest of your whole life, you'll find an excuse. I BELIEVE THAT EVERY WOMAN HAS LIMITLESS POTENTIAL. MOST PEOPLE ARE ONLY USING 10% OF THIS POTENTIAL. THE OTHER 90% LIES DORMANT UNDER 5 THINGS. PARADIGMS ARE AN ACCUMULATION OF OTHER PEOPLE'S BELIEFS, FEARS, EMOTIONS AND MINDSET. IN THIS CASE THEY ARE AN ACCUMULATION OF OTHER PEOPLE'S LIMITING BELIEFS AND THEY AREN'T TRUE. IT TAKES ATTENTION TO REMOVE THESE BELIEFS. THAT'S WHAT THIS MENTORSHIP PROGRAM IS DESIGNED TO DO. THE RESULT IS AN ENTIRE LIFE UPGRADE. ​WHO WOULD YOU BE IF YOU REMOVED YOUR LIMITS? INSIDE OF YOU IS A SUPERSTAR. "Steph understands that true change comes from within. Her beautiful soul provides a welcoming space to unpack your limiting beliefs and allows you to create the change you want in both your mind and body. I love Steph's coaching style because she gets it. She too has been through the struggle time and time again but now she's conquered it and has thankfully made simple, easy to follow steps to help guide her clients to success. Hiring Steph as your coach will be the best decision you've ever made." If you're ready to completely change your body and create the life you want with the support of expert coaches, proven weight loss, wealth, love and lifestyle strategies and a group of fit and fearless friends that will become your support team, the UPGRADE Mentorship Program is for you. 1. Click the button below to schedule a complimentary 30 minute interview. 2. Find the payment option below that is best for you. 3. Read and sign the coaching contract. 4. Check your email for your welcome information and schedule your first private mentorship call with Steph. 5. Get excited for an entirely new upgraded life in every way! It's your time! ___ Have fun in everything they do. ___ Attract relationships that are meaningful and full of love. ___ Laugh a lot and smile all the time. ___ Develop deeper caring relationships about other people. ___ Light up every room they walk into. ___ Handle challenges with grace, awareness and faith. ___ Become role models that women look up to. ___ Inspire others to be their best. ___ Be fit, heathy and radiate happiness. ___ Be trendsetters and leaders. ___ Be beautiful inside and out. ___ Uplift everyone around them. ___ Be kind and honest. ​"Steph's program has completely changed my life! Not only did I lose 8 inches all over my body and drop 17 pounds, I also gained a new healthy relationship with food that no health or fitness program has ever taught me. I went on my first "diet" sometime in middle school and since then, have tried fad diets and various fitness programs that worked for a short period of time, but the weight always came back. The positive approach that Steph has as a coach and the tools she provides during her programs to teach participants a healthy lifestyle is what makes this program different from any other program out there. This program gave me all the tools I needed to continue living a healthy lifestyle after the program ended and I am happy to say that I am continuing to keep the weight off and have dropped 4 more pounds! Thank you Steph for creating this incredible program! !